I love cherries. They taste like summer to me. The Sugar & Spice Card Kit has cherries in it. Hmmm, now that I have this card kit...what can I do with it...besides the obvious...write recipes on the cards...I know, I'll make a card! I decided to use the cute printed border on the recipe card for a greeting card. I also used one of the stickers in the kit. I added a card base, Sweet Leaf and Tulip card stock. 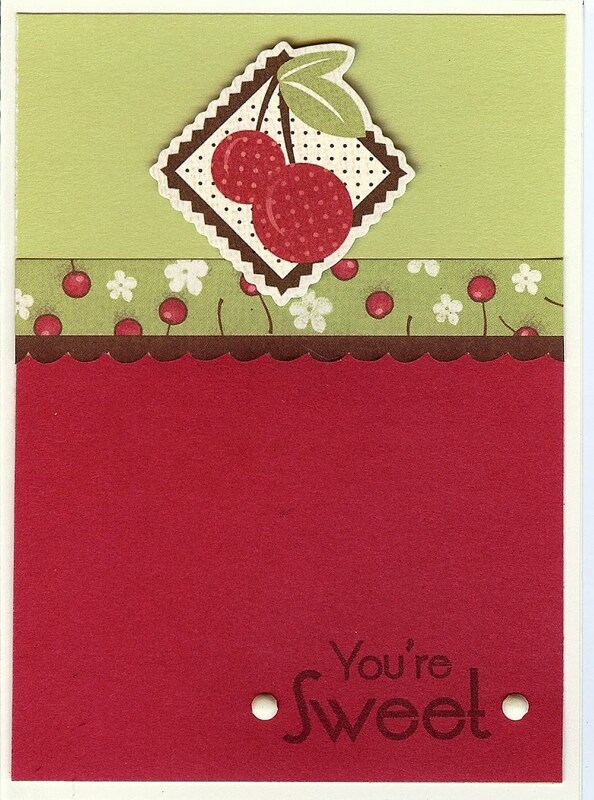 The card pattern I decided to make is a basic one, that I saw in Originals, CTMH's card confidence program. I wanted to "pop" the sticker up off the card. My tendency is to use foam mounting tape (which I call "puffy tape.") This time I decided to do something different. I used the unused portion of a Dimensional Elements sheet. Dimensional Elements are CTMH's answer to chipboard. I love the shapes that they carry. Anyway, after you've used the "inside" of the shape, you have all that negative space. Start using it for good! Use it instead of puffy tape to pop things up off your pages! It's free, you already have it! See how cool it looks? The card is nice, but still looks kind of plain to me, so I decided to put something in the lower right hand corner. Hmmm, Splendor Designer Brads?...no...Colonial White Brads?...better...stamped sentiment?...yes! I decided on "You're Sweet" the whimsical fruity set. I debated between using Tulip ink (the red color on the card--too light, might not show up enough), Cranberry ink (better...it's a little darker shade of red) and Chocolate ink (brown). I decided on Chocolate. I like it, but it still needs more. Colonial White brads would be a nice addition! I used my handy-dandy Piercing Tool (the "Pokey Thing") to poke the holes for the brads. Another one of my FAV tools. If there's one thing I've learned at the Nordstrom makeup counter, it's all about the tools! I encourage you to use the stuff you have - they call it Shopping Your Stash. :) Have fun with it! FANTASTIC idea, Lisa! Love it!